Discussion in 'Firewood, Heating and Wood Burning Equipment' started by bfrazier, Apr 16, 2019. Would You Rather Make Cake or Pie? I don't give a crap, I clicked on this by mistake! Well this is an easy game - whatever your opinion is - you WIN! 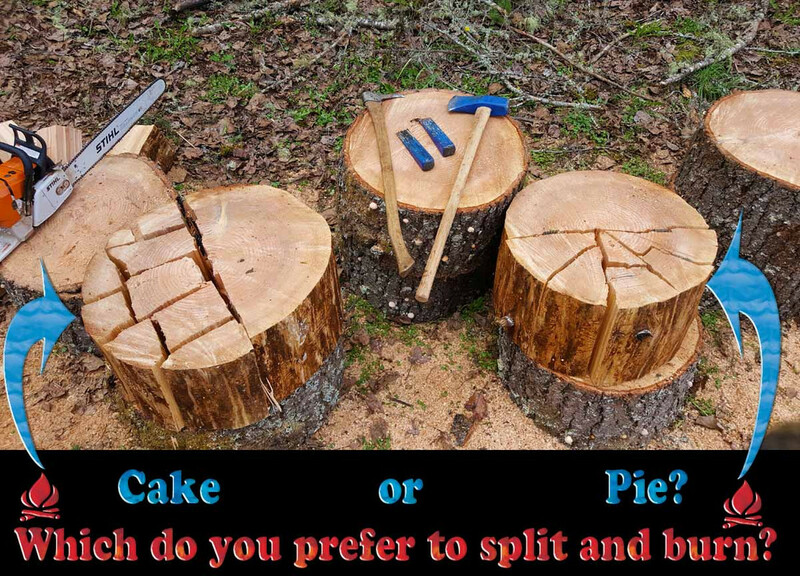 So would you rather split your wood into mostly squares (Cake!) or mostly triangles (Pie!) And why is that? The ONLY way to loose at this game is to not give the rest of us an answer. And tell us why if you have a reason. farmer steve and al-k like this. Hinerman, farmer steve, al-k and 1 other person like this. Me myself? I have a rectangular firebox in my woodstove. I like making the square "cake" that fits in tight. My grandma said "Logs like friends." I like how the wood fits that way. Depends how big the round is. I like my splits around 6 inches or so, so if the round is up to 12 inches, I bake me some pie but I like cake if the round is big. sb47, Chainmale, Hinerman and 4 others like this. I've seen the pictures of some of the wood you're dealing with. Huge noodle wood! You could make stars or crescent moons for Christ sake! Hinerman, Saiso, farmer steve and 2 others like this. I like some of both. farmer steve, bfrazier, Jakers and 1 other person like this. farmer steve, bfrazier and Ronaldo like this. I like one handed pieces, if it takes two to pick up, split it again, shape is irrelevant. aokpops, jrider, farmer steve and 2 others like this. Picked pie because I never tried the cake method. I must try sometime! farmer steve and bfrazier like this. I prefer cake and that’s what I shoot for. Not every piece lends itself to cake splitting so pie is ok too. Cookies aren’t all that bad either but they really don’t stack worth a crap. Reason why I prefer cake: easier stacking especially on the laced corners of my stacks and tighter loads in the woodstove. Cake! If the piece is big enough, otherwise I'll be content with pie. 1. I think cake stacks nicer, particularly the criss-cross end caps of my stacks. 2. I think it is a easier to grab a square piece than a triangular one with one hand. The square pieces don't require me to think if I'm picking up on the point of the triangle which could allow the wood to slip. bfrazier and 4seasons like this. bubmiller, Flint Mitch, Hinerman and 5 others like this. Cake if it is big enough. But I like 8 inch rounds that don't require splitting best. It needs to be over 14 inch rounds to make use of cake though so 10-14 inch get pie. farmer steve, bfrazier and old guy like this. You guys all make some great points! Now we all have one more thing to think about.... cookies! Thanks for playing along - maybe it will help someone out to try something new. I'm not fussy and neither is the stove. If it burns and makes heat, in it goes. allstihl, bfrazier, farmer steve and 1 other person like this. Depends on the size of the piece being split. Seeing how we’re referencing the size pictured, I’m a cake guy. Anything small it’s pie. Yarz, bfrazier and jrider like this. Whatever shapes come out the fastest. allstihl, Yarz, TimberWolf530 and 2 others like this. What he said. I never even pay attention, I do try to vary size, but other than that, I just split it. jrider, James Miller, Ronaldo and 1 other person like this.